More than 2000 teens and adults will attend the annual Momentum Youth Conference, including a group from the Winona Lake, Ind., Grace Brethren Church. It’s an important week in Grace Brethren world as Momentum Youth Conference, the annual Grace Brethren event sponsored by CE National, kicks off in Cedarville, Ohio, tomorrow (Monday) evening. Later in the week, Celebrate 2010, the annual conference of the Fellowship of Grace Brethren Churches meets in Cincinnati, Ohio. The two groups will join on Saturday for a city-wide outreach in Dayton, Ohio, when We Care Miami Valley hosts block parties, neighborhood clean-up campaigns, and door-to-door literature distribution in an effort to blanket the Miami Valley region with the love of Christ. Momentum meets through Sunday, July 18, on the campus of Cedarville University. Among the featured speakers are Mark Cahill, Jeff Bogue, Greg Speck, Ergun Caner, Mark Batterson, Kondo Simfukwe, and Alex and Brett Harris. Worship throughout the week will be led by the Fee Band, Jeremy Byng, Laura Story, and Aaron Keyes. There also will be opportunities for students to grow in their relationships with God, participate in NAC (Nurturing Abilities for Christ), and connect with teens and adults from around the world. Celebrate 2010 begins Friday, July 16 with the first official event being the annual Chaplain’s Luncheon, honoring Grace Brethren military chaplains and hosted by the Grace Brethren Investment Foundation and the Eagle Commission. 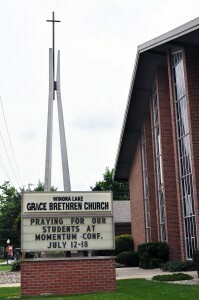 In the afternoon, the Association of Grace Brethren Ministers and Women of Grace USA will hold their meetings. Throughout the day, pastors may have their portrait taken (at no charge) for the first-ever AGBM pictorial directory. Sessions are being held at the Crowne Plaza Cincinnati North. On Saturday, Celebrate 2010 participants join with Momentum teens to show We Care Miami Valley and for the closing session at Cedarville University in the evening. The rest of the extended weekend is filled with celebratory worship, corporation meetings, and fellowship times as the annual Grace Brethren “family reunion” enjoys a shorter conference than usual. Speakers include Mac Pier, Tom Hocking (2009-2011 moderator of the FGBC), and Jeff Bogue, pastor of Grace Church, a Grace Brethren church in Akron, Ohio. The conference concludes Monday, July 19, but that afternoon an optional workshop on Reaching Ethnic America begins. Let by Jay Bell, of Grace Brethren International Missions’ Internationals USA, participants will learn practical tips on taking the gospel to the nations in one’s own community. The session includes a Monday visit to a Hindu temple and workshops on Tuesday before wrapping up late in the afternoon. Pray for both events. Click the links to find prayer requests for each event: Momentum2010 and Celebrate 2010. Be sure to follow reports from both conferences on this blog and by following fgbcworld on Twitter (look for #Momentum10 and #Celebrate10) and Facebook.